Without removing the corn husks from the corn cob, peel husks down, uncovering the ears of corn. Remove the silk from the corn ears. Cut the ear of corn from the stalk (a small piece of corn can be left on the stalk). Place the corn husks, still attached to the stalk, into a bowl of water. Cut each ear of corn, the zucchini and eggplant into 3/4-inch medallions. Place medallions into a medium mixing bowl. In a small bowl, add softened butter, Dijon mustard, lemon juice, thyme, minced onion and garlic salt. Blend well and add mixture to the bowl of vegetable medallions. Make sure all vegetables are coated well. Pierce each corn stalk with a metal skewer. Add vegetable medallions one at a time to the skewer, alternating variety. The last vegetable on each skewer should be a corn cob tip. Fold the corn husks back over the vegetable medley, forming what looks like the original ear of corn. Preheat charcoal grill to 400°F. Wrap vegetable medley corn husks in aluminum foil and place on hot grate over direct heat for 20 minutes, turning once (cooking 10 minutes on each side). Carefully remove foil and vegetable medley corn husks on hot grate over direct heat for 10 minutes, turning several times to prevent burning. 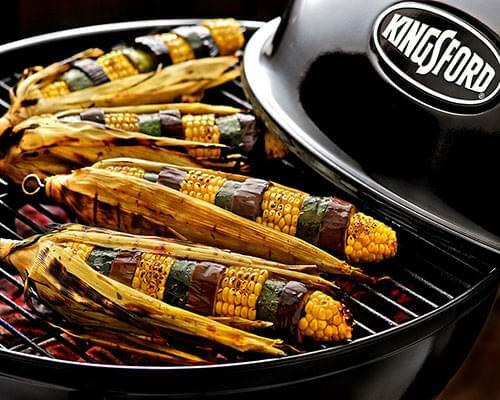 Remove corn from grill and peel down husks for a great presentation.